If you return home from a boating or fishing trip in the dark, you want to be able to see your dock. The last thing you want is an accident. 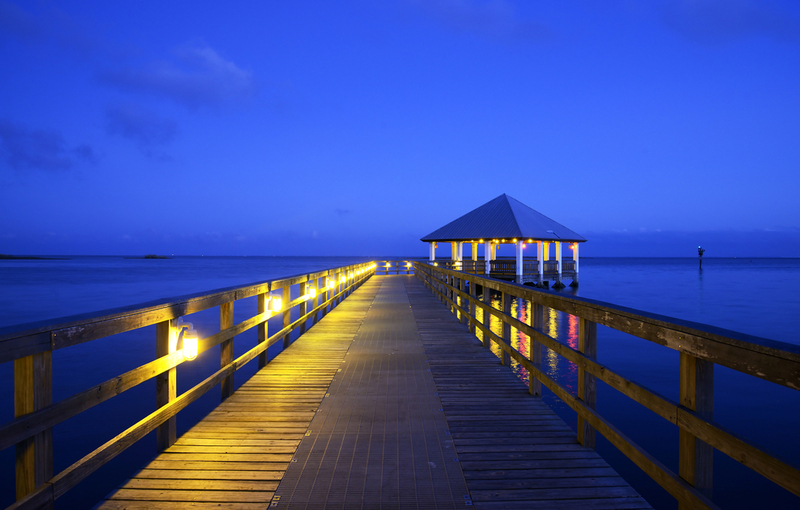 Dock lighting benefits you by improving security and safety. Not only that, but it can help create an amazing place for entertaining your guests. Add new dock lights or update old ones to enjoy the advantages they can provide. Besides enhanced safety and security, dock lights can turn your ordinary outdoor space into something extraordinary. You live on the water, so why not create a more enjoyable atmosphere for you, your family and guests to use? Another good reason: replacing outdated light bulbs and old fixtures to new, efficient LED dock lighting will lead to a major savings.LED dock lighting benefits your wallet both by lasting longer and using less power. LED lighting, which has made advances to become extremely durable, typically has a life span of up to 100,000 hours or more. Just imagine! With your dock lights on for eight hours a day that means they would last for more than 34 years. Compare that to an incandescent light, which lasts up to 5,000 hours. Most homeowners prefer lights for a dock area called bollards. These sturdy, short, vertical posts can be used to mount lighting fixtures, as well as mooring boats. The pillars typically stand about 24 to 35 inches high, or as high as a person’s knee or hip. The height means the lighting shines below the cabin level of most large houseboats. Additionally, boat dock lighting consists of durable plastics that repel water and resist mineral salts found in saltwater and even fresh river, bayou or lake water. Avoid acquiring dock lighting housed in metal. This material corrodes quickly, requiring you to replace your lighting sooner than later. You can also choose underwater LED lighting for your dock. If you like fishing or watching them from your dock, this type of lighting works great at attracting marine life. Blue or green lighting has proven to perform the best. Additionally, these underwater lights resist corrosion, so you don’t have to worry. We also offer a few other recommendations when you install dock lighting. First, avoid excessive lighting that contributes to “light pollution” or an unnatural “sky glow.” This becomes especially important, if you live at the beach. Minimal illumination gives baby sea turtles the best chance to reach the Gulf of Mexico and survive its many predators. Make sure you use “full-cut off” or “fully shielded” light fixtures that directs light downward, instead of into your eyes. Plus, you want to keep lighting from spilling into neighbors’ yards. Install colored lights, such as red or green, at the end of your dock so you can find where to pull up your boat more easily. Do not leave the end of your dock un-illuminated. Additionally, for your safety, be sure to place just enough light to illuminate the entrance to your dock. Don’t miss out on all the dock lighting benefits you could reap with new LED lighting and fixtures. Call us today and one of our trustworthy and highly-trained Henderson Electric team members will help you! Our family-owned business has served its commercial and residential neighbors with all their electrical needs since 1955.